The Lucid matrix key has been designed for the specific identification of Ophioninae reported in the Afrotropical Region, mostly based on the morphological revisions of Gauld & Mitchell, 1978, Gauld & Mitchell, 1981 and Gauld (1982). We recommend close consultation with these revisions while using the above Lucid matrix key. 1. Intensive use of the magic wand button is recommended to find the best discriminative feature. 2. Quantitative indices are given with second and third quartiles in square brackets, i.e. the range encompassing 50% of the reported values. The more out of this range a measure is, the more diagnostic the character is. 3. The limits of the states of quantitative indices were determined according to the statistical distribution of the variable, and the species have been coded loosely to avoid false negative. If you measure a value close to one of the limits, we recommend that you select the corresponding alternative option as well. Dichotomous keys to genera and species of Afrotropical Ophioninae (updated from Gauld & Mitchell, 1978 & Gauld, 1982). Images to follow. Gauld, I.D. 1982. 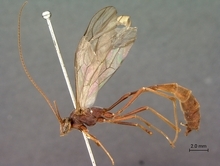 A revised key of the Enicospilus antefurcalis (Szépligeti) (Hymenoptera: Ichneumonidae) species group of the Afrotropical region. Bulletin of Entomological Research 72: 33–38. Gauld, I.D. & Mitchell, P.A. 1978. The taxonomy, distribution and host preferences of African parasitic wasps of the subfamily Ophioninae (Hymenoptera, Ichneumonidae). Commonwealth Institute of Entomology, Slough, England, 287 pp. Gauld, I.D. & Mitchell, P.A. 1981. The taxonomy, distribution and host preferences of Indo-Papuan parasitic wasps of the subfamily Ophioninae (Hymenoptera: khneumonidae). Commonwealth Agricultural Bureaux, UK, 611pp. Rousse, P. & Villemant, C. 2012. Ichneumons in Reunion Island: a catalogue of the local Ichneumonidae (Hymenoptera) species, including 15 new taxa and a key to species. Zootaxa 3278, 1–57. Identification keys produced by Pascal Rousse and Simon van Noort (Iziko Museums of South Africa) from keys developed by Ian Gauld & P.A. Mitchell (1978) and first published by CABI. Photographs © Simon van Noort or Pascal Rousse or Aisha Mayekiso (Iziko Museums of South Africa).